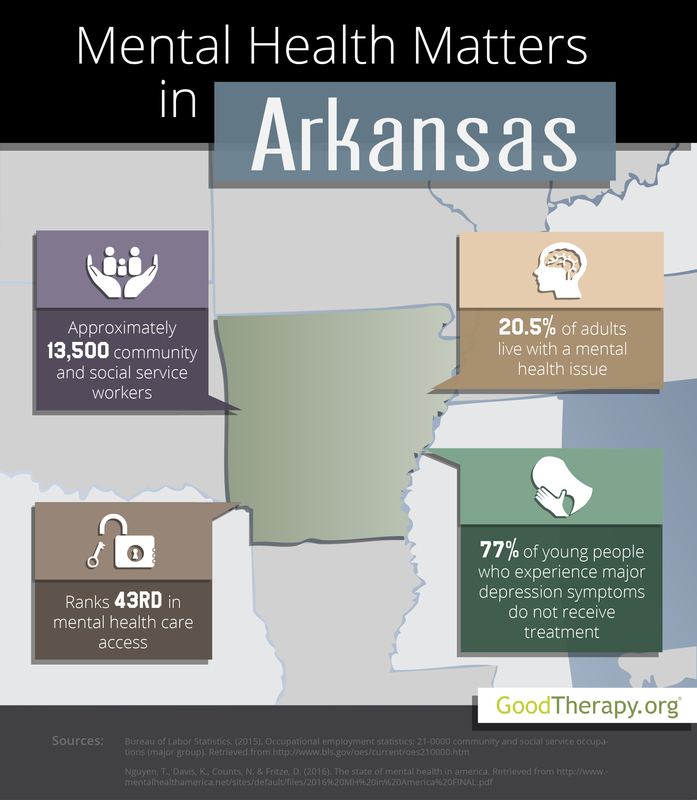 Find a therapist in Arkansas with GoodTherapy.org. Reports from the United States Census Bureau estimate nearly 3 million residents lived in Arkansas in 2015. According to workforce data gathered by the Bureau of Labor Statistics, approximately 13,510 were employed in social service, health care, or community-related fields in 2015. Common occupations included work as clinical social workers, therapists at residential treatment centers, parole officers, religious workers, guidance counselors, and marriage therapists. A survey titled The State of Mental Health in America is conducted nationwide each year by Mental Health America (MHA). Out of all 50 states and the District of Columbia, the 2016 edition of this survey gave Arkansas an overall rank of 41st for mental health conditions and services within the state. This indicates a high number of experienced mental health issues and lower rates of access to needed care. One of the chief concerns for therapists and mental health professionals in Arkansas is the ability for people experiencing mental health issues to obtain the care they need. The 2016 MHA survey listed Arkansas in the 43rd position in regard to access to care—which suggests that there may be factors within the state restricting residents from receiving treatment. Statewide measures which correlate with this ranking include high rates of poverty, high rates of child maltreatment, and high rates of obesity. More than 1 in 5 adults in Arkansas are currently affected by at least one mental health issue, while nearly 5% of all adults have had serious thoughts of suicide. According to the 2016 MHA report, 21% of adults experiencing mental health issues currently do not have health insurance, while 48% did not receive any mental health service at all. Roughly 31% of adults who have a disability are unable to obtain professional care due to the cost of treatment in Arkansas. Data from Mental Health America’s report indicates a relatively low percentage of young people are affected by severe symptoms of major depression. Additionally, the survey also shows that only 16% of young people with serious symptoms of major depression received consistent depression treatment, while 77% of minors who had episodes of major depression did not receive any mental health services at all.